Books have been around for as long as humanity has been able to write. Before the internet, they were the primary sources of reference and many of us still love to get lost in a good novel whether on the commute to work or just before we go to sleep. In this digital age, we are constantly looking for ways to make things more compact and efficient and the world of books is no different. While there can be nothing quite like the feel of a new book, the book world has been revolutionised in the last 5-10 years with the introduction of digital e-readers. These e-readers have been designed to hold from hundreds right up to thousands of books in digital form. A large number of readers have taken to the new form of reading well while others have been staunchly opposed to the adoption of digital books. Whichever side you find yourself on, it seems that e-books are here to stay alongside their paper counterparts. This acceptance has led to an increase in the number of book scanning projects we have worked on here at Pearl Scan for clients looking to reclaiming space taken by mountains of books and access them all on one portable device. Let’s take a closer look at the book scanning process and the methods involved to creating to digital books. Unbound book scanning, also known as destructive book scanning, is the standard book scanning approach. This involves taking apart the pages from the spine of the book and scanning each individual page. You get great and top quality scans. This service is low cost. Your book will no longer be in the condition you submitted it in. However, you can still have the paper pages back if you wish. Bound book scanning, also known as non-destructive book scanning, is the second option with Pearl Scan. 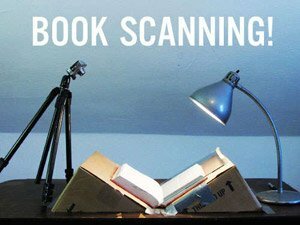 This book scanning process ensures the pages of your book remain intact and together throughout the entirety of the scanning. This method is often used on books that are old, delicate, expensive or hold sentimental value to our clients. Your book remains in the same condition as you gave it to us. The book is exposed to considerably less light and heat during the scanning process. This method will often take longer to ensure care and delicacy. To learn more of our book scanning and digitisation guide Click Here. Which method do I need for my book scanning project? With these two book scanning methods, you are given complete control over how your book is scanned and dealt with at the Pearl Scan scanning bureau. If you don’t mind your book being taken apart to be scanned then unbound book scanning will be the most effective, cost saving option for you. If your book holds more value, whether in terms of real value or just sentimentally, bound book scanning is the method you should choose. It only adds a small extra cost but gives your book the necessary protection. Here at Pearl Scan, we offer a tailor-made book scanning services giving you the choice of a scanning method and a scanning format to ensure you receive a service you are completely happy with. If you would like some more information about the books scanning service we offer, browse our website and blogs or get in touch today, we’d love to hear from you. For a free, no obligation, quote for your book scanning project, complete our online Contact Us Form. Converting your book to ePub – A short guide. 3 reasons you should convert your book to eBook.